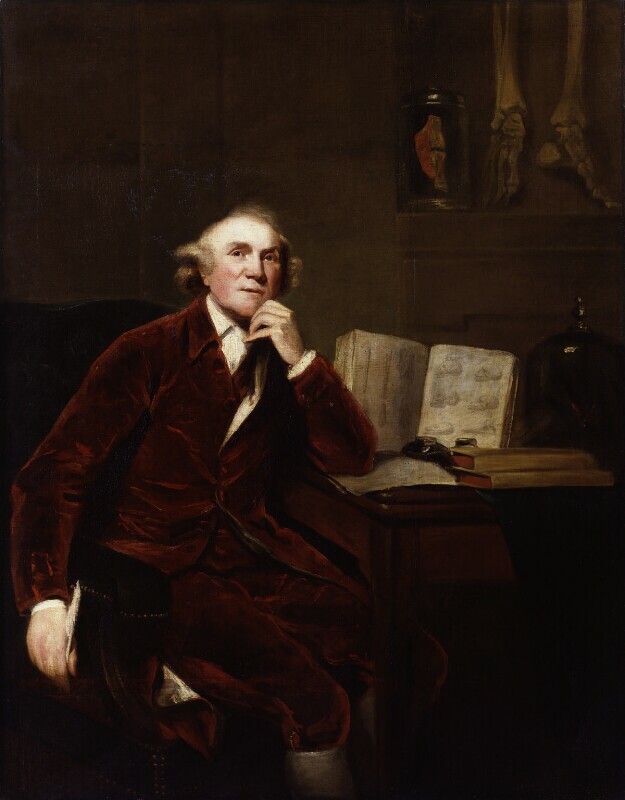 John Hunter (1728-1793), Surgeon and anatomist. Sitter in 13 portraits. John Jackson (1778-1831), Portrait painter. Artist associated with 231 portraits, Sitter in 6 portraits. Sir Joshua Reynolds (1723-1792), Painter and first President of the Royal Academy. Artist associated with 1413 portraits, Sitter associated with 38 portraits. This is a copy of portrait by Sir Joshua Reynolds, made in 1786. Hunter is shown seated at his writing table absorbed in thought, surrounded by medical specimens and books. Philosopher and politician Edmund Burke instigates impeachment proceedings against Warren Hastings, former Governor-General of Bengal after concerns about the moral standards of the British in India are raised. Prime Minister William Pitt appoints commissioners for the reduction of the national debt and establishes a sinking fund of £1 million a year. Government approves the establishment of a penal colony at Botany Bay. Robert Burns publishes Poems Chiefly in the Scottish Dialect bringing him immediate success across the country. Engraver and publisher John Boydell initiates plans for his Shakespeare Gallery in an effort to establish a school of British history painting. Merchant David Dale establishes New Lanark in South Lanarkshire, Scotland, as a model cotton milling community. General Charles Cornwallis succeeds Warren Hastings as Governor-General in India. Composer Wolfgang Amadeus Mozart's Marriage of Figaro premieres in Vienna. Francisco Goya is appointed court painter to the Spanish king Charles III.